Here are the details of the new Tall Poppies release of Australian sacred choral music, including Magnificat and Nunc Dimittis by Andrew Schultz, performed by the Brisbane Chamber Choir/Graeme Morton. It is truly amazing that we’ve waited until 2016 for an Australian choir to record a CD of Australian sacred choral music. Yes, this is the first!! It’s well worth the wait. A lot of this music was commissioned by the choir. Specially mention must be made of Ross Edwards‘ Mass of the Dreaming, a substantial work that will definitely be included among the pantheon of Australian choral works in the future. It’s the largest work on this disc and one of the most engaging. 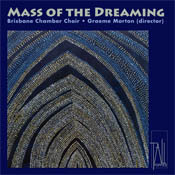 The Brisbane Chamber Choir sings these works with skill and passion, ably directed by Graeme Morton. The Choir has also commissioned the cover art from Kangaroo Valley-based artist Githa Pilbrow, who was inspired by the 2016 Vivid! exhibition in Sydney. Her work Cathedral Light makes a lovely cover.